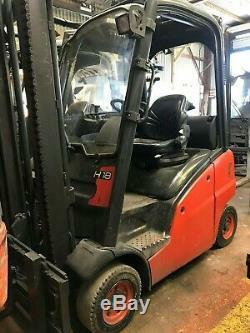 2011 Linde H18D 1.8 tonne lift capacity forklift truck, very nice machine in excellent working order. 4.25 metre lift height with standard mast Integral side shift Front and rear work lights 3 piece cab with one door The truck runs and drives perfectly with no faults and will be supplied with a current LOLER certificate. Just had major service including new cambelt kit and water pump. Balance must be paid in full before truck can be collected. Also available to hire at very competitive rates depending on application and location. For more information or to arrange a viewing please call 07867807353. 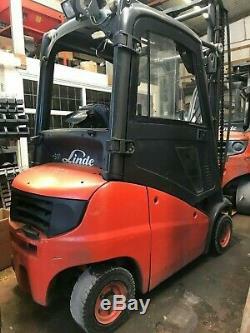 The item "Linde 2011 H18D 1.8 Tonne Diesel Forklift Fork Truck" is in sale since Thursday, March 14, 2019. This item is in the category "Business, Office & Industrial\Material Handling\Warehouse Loading & Unloading\Warehouse Forklifts & Stackers". The seller is "ilsforklifts" and is located in Rochester, Kent. This item can't be shipped, the buyer must pick up the item.